Michael Scott, is that you? 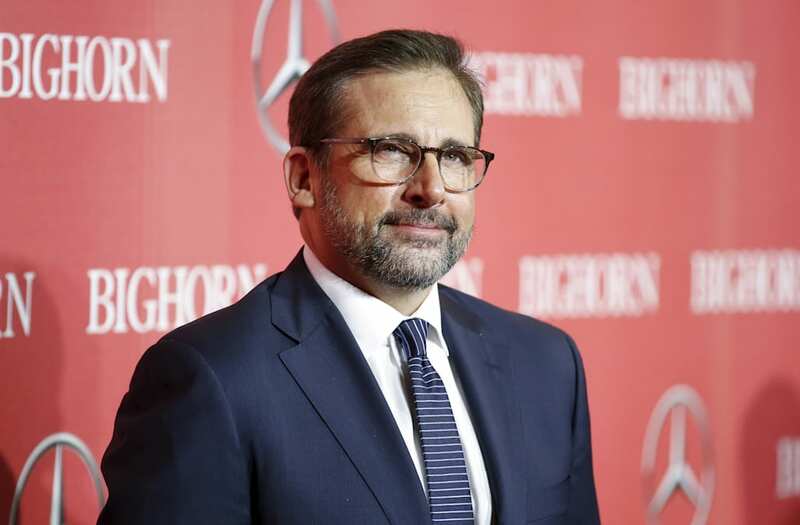 Steve Carell is looking a lot more dapper than he did during his days on The Office and his fans are taking notice. While promoting Despicable Me 3 with co-star Kristen Wiig, the 54-year-old actor turned heads last week when he stepped out in London, England, wearing stylish shades, a fitted blue sweater, khaki pants and trendy leather sneakers. ET's Carly Steel spoke with Carell on Saturday at the Despicable Me 3 premiere in Los Angeles, California, and he hilariously reacted to the buzz surrounding his new look. "I am so sick of people just looking at me for my physical attributes," the father of two quipped. "It's just genetic. There's nothing I can do." Carell added, "I'm bursting with pride. That's very nice." Needless to say, the Twitterverse couldn't help but compare Carell's new sense of style to that of his character, Cal, in Crazy, Stupid, Love. In the 2011 romantic comedy, Jacob (Ryan Gosling) gives Cal a makeover in an effort to boost his confidence after his split from his wife, Emily (Julianne Moore). "Honestly take your Goslings and your Zayn Maliks and give me 2017 Steve Carell," one Twitter user commented on Carell's style. "Someone plz tell me when Steve Carell got grey and turned into George Clooney's brother," another fan wrote. The tweets didn't stop there! "If you don't want Steve Carell at his 2006, you don't deserve him at his 2017," read one tweet. "2017 Steve Carell is 2011 Steve Carell after his wife screws David Lindhagen in Crazy, Stupid, Love," another fan proclaimed. One star who took notice of Carell's charisma early on was Emma Watson. In April 2015, the 27-year-old actress penned a handwritten note, praising the Golden Globe winner. "You were pure genius in Little Miss Sunshine (one of my all-time favorite films), my brother became obsessed with you after Anchorman," she wrote. "I wanted to marry you or have you adopt me after Crazy, Stupid, Love, I hated that guy you played in The Way Way Back, and then you were mind-blowing in Foxcatcher." Despicable Me 3 hits theaters on June 30.